Coolant, also known as antifreeze, keeps your engine running at the proper temperature. 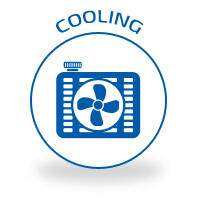 The cooling system is subject to wear and tear, even in normal driving conditions. Regular maintenance, especially coolant flushes, help to get the best performance and longest life of its components. In the engine, the coolant/antifreeze is mixed with water to form radiator fluid. It is important to keep the correct ratio, flushed periodically. This keeps your engine at the optimum temperature and prevents corrosive materials from collecting and spreading through the engine. When you check your fluid, at first glance, it may appear clean and clear. The danger lies from hidden contaminants that settle at the bottom unseen. These will flow through the system as you drive, and can cause problems with all components, including the radiator cap, thermostat, hoses, water pump, and radiator. As coolant travels through the engine, debris and corrosion (that collect in the fluid with normal use) can cause friction and damage sensitive components. Parts that wear quickly under normal conditions have an even shorter lifespan. Ignoring cooling system flushes put you at risk for extensive damage and costly repairs that could have been avoided with proper maintenance. The best way to maintain your cooling system and prevent engine damage is with preventative maintenance. Stop by or schedule your next coolant flush by calling 205.663.6088.